For deer around the state, it&apos;s the calm before the storm. 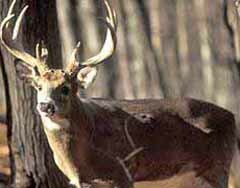 The Wisconsin gun-deer season gets underway on Saturday morning, and wildlife biologist Michelle Windsor with the DNR&apos;s Black River Falls office says there will be no shortage of targets for hunters this season. The population is estimated to be near 1.8 million and with the possibility of snow in the forecast in several areas, hunters should have no problem finding a target. As of Wednesday, license sales were very similar to last year. Because of the large deer herd, "earn-a-buck" carries over from last year as well. Windsor says due to some unfortunate events over the past few years concerning trespassing, officials want everyone to mind their location. Even if private property is not marked, it is still illegal to hunt on it without permission.